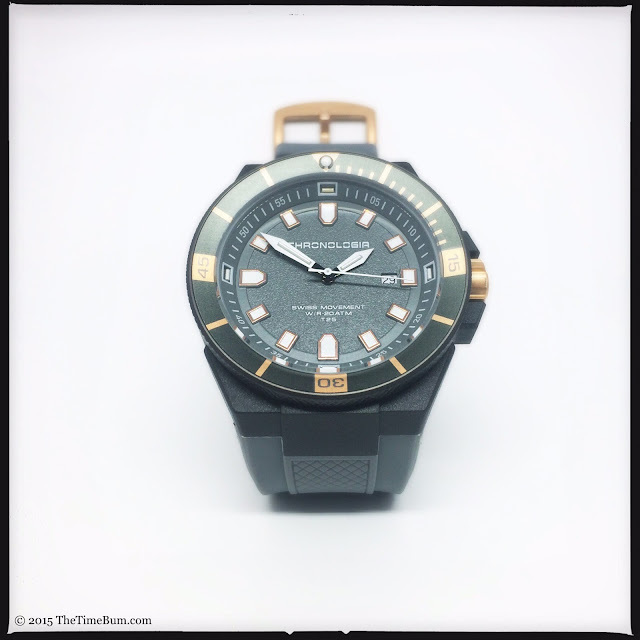 I like tritium, so when the folks at Chronologia asked me to review their new Trigalight Dive Watch, I had to give it a go. Why tritium? Well for one thing, it's a fun word to say - kind of like a bird call. For another thing, it is impossible not to feel like a Bond villain when you are wearing tubes filled with radioactive gas. Finally, I like it because tritium will light up your watch face in a very cool, and very effective manner. Chronologia is a new watch company trying its fortunes on Kickstarter. Their background says they are a team of industry veterans and it shows. From the design and execution of this watch it is clear that this is not their first rodeo; however, the project is currently struggling to fund. 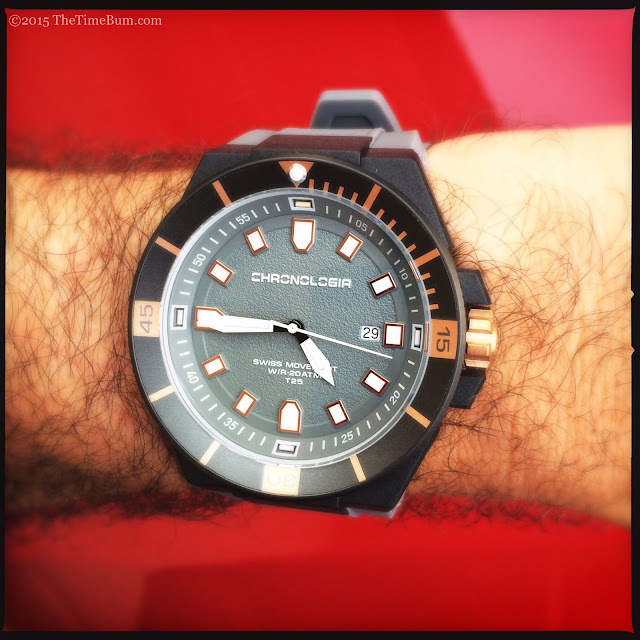 The Trigalight Dive Watch is available in chronograph and three-hand versions. Both are rated for 20ATM/200M water resistance. 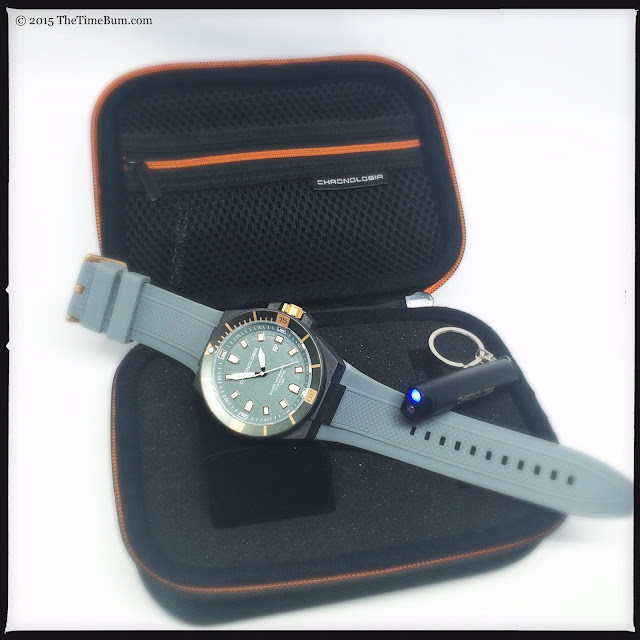 They feature carbon fiber cases, screw down crowns, and a Swiss made quartz movements. 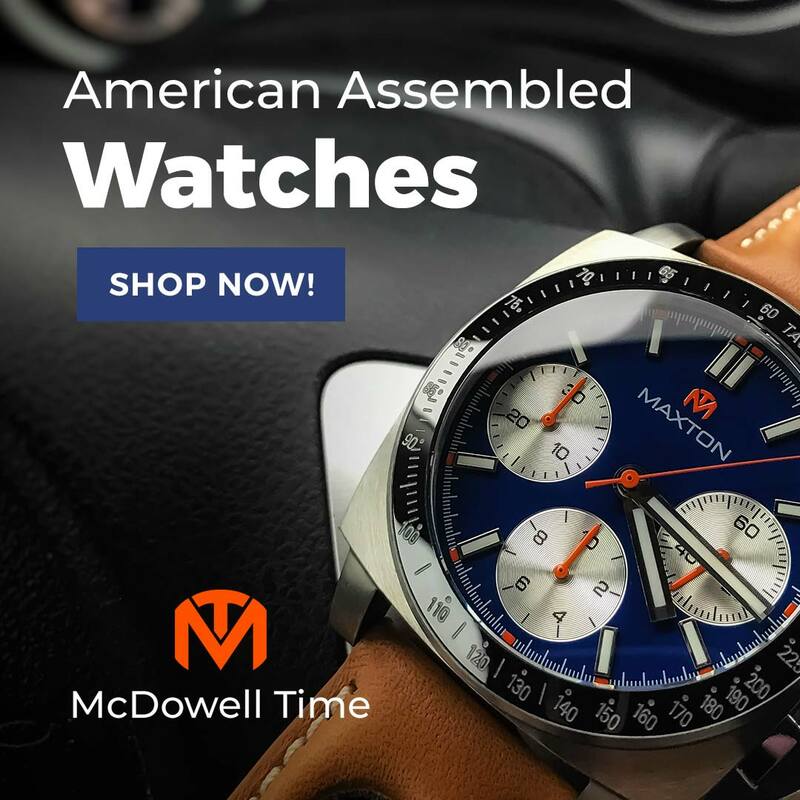 Retail pricing will be €354 (@ $387 USD) for the three-hand and 468€ (@ $511 USD) for the chronograph, but early backers can pre-order for as low as €129/218 ($142/194 USD) The watch arrives in a zippered nylon case fitted with dense foam. A keyring/mini-flashlight is also included. My sample watch was an R004.5 three-hand with a grey dial, matte rose gold accents, and a Ronda 515 inside. The case is 46mm wide, 55mm long, and 15mm thick with even, matte black finish and hard angles at its four corners. It is quite light. Not flimsy, but comfortable. An eight-toothed, gold PVD crown flanked by blocky crown guards sits at 3 o'clock. It is broad, but not long, which also helps keep the Chronologia's footprint to a manageable size. The crown design is repeated in the embossed stainless steel case back. 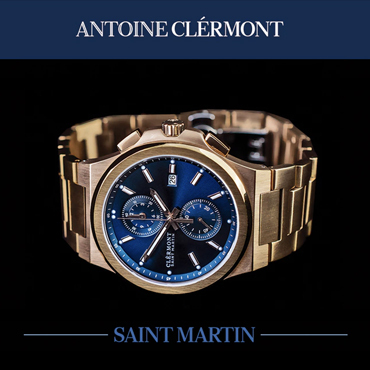 Up front, the watch wears a flat, sapphire-coated mineral crystal. A 90-click, unidirectional aluminum bezel mirrors the steep geometry of case, angling inward to the dial for a dished effect that also provides some additional protection for the crystal. 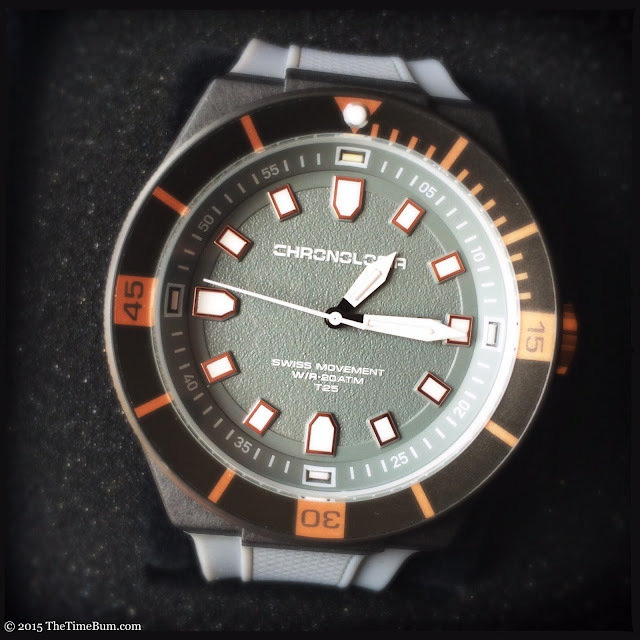 It has a knurled edge, printed dive timer, and a luminous (but not tritium) pearl at top center. The action is decisive and it snaps smoothly. There is no wobble or back play. The Chronologia has a handsome face. A white date wheel peeks through at 3 o'clock. 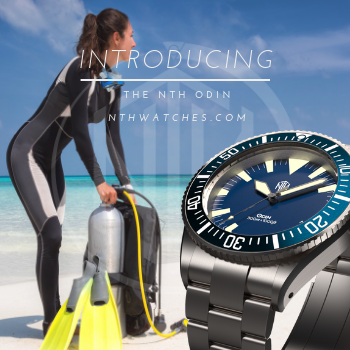 Granted, you really have little need for a date complication on a dive, but it is a concession to the fact that the watch will not always be used underwater. An angled, white-on-grey chapter index rings the dial. It is set with T25 Trigalight tubes at 12, 3, 6, and 9. The white sword hands are also set with tubes while the applied rose gold markers on the pebbled grey dial are treated with a conventional phosphorescent lume. 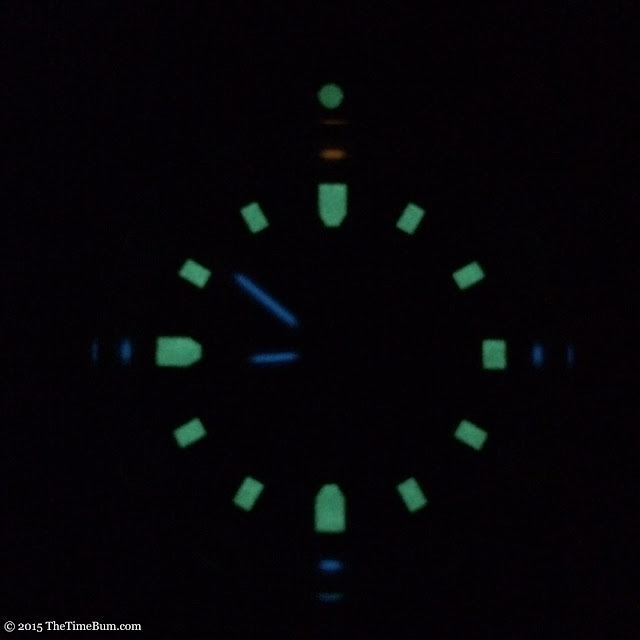 This combination of different luminous material makes for a cool and colorful glow at night, and when the bright green glow of the light-charged lume ultimately fades, the tritium tubes burn on. Fully charged, the markers are a good complement to the tubes, but when they go dim, you are left with only six tubes, which really the bare minimum. On the one hand, I find it hard to complain about this. After all, I have reviewed plenty of watches that had no tritium tubes at all and I didn't criticize them for it. 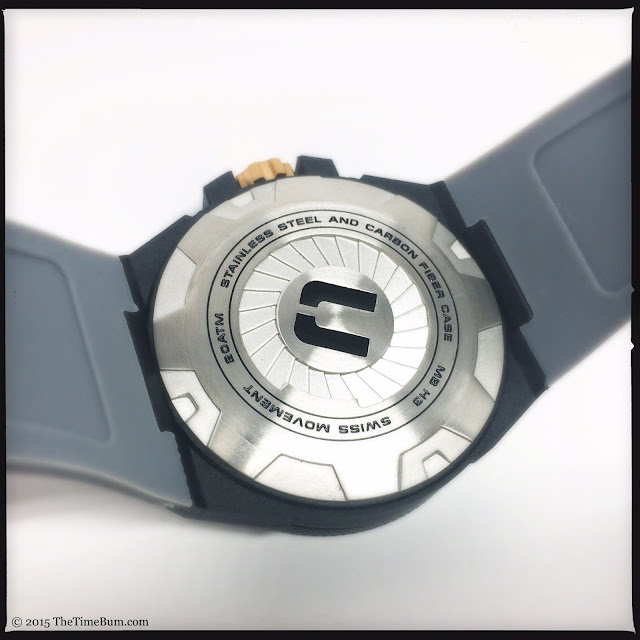 On the other hand, they were not billed as tritium watches. When you put "Trigalight" in your watch's name, it is going to raise expectations and in my mind, a tritium watch has a tube at every marker. The Chronologia's set up is more like a tritium back up, but it works. Overall, it is a sensible, legible layout. 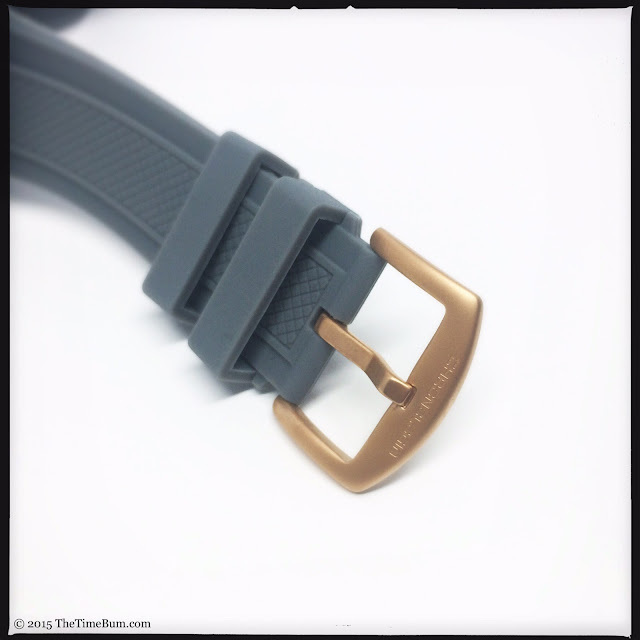 The strap is grey, diamond patterned silicone with a signed, matte gold buckle. It is soft, comfortable, and it even fit my 6.5" wrist with one adjustment hole to spare. The base ends fit around the central lugs and secure with screws. I would be perfectly happy with this strap, and that's a good thing because the mono-lug arrangement makes it all but impossible to fit anything other than a custom strap or a factory replacement. This is a larger watch than what I would normally consider, but once I put it on, I discovered it was not the behemoth I had expected. This due in large part to the lug design. Unlike the two horn arrangement on most watches, the Chronologia uses a single lug that is angled steeply downward, following the sheer planes of the case and positioning the strap almost straight down. This allows the strap to wrap your wrist without bulging outward first, making the watch appear shorter. I hate saying that a given watch wears like one size or another because there are so many design factors that affect our perception, but if I really had to, I'd say this is a 46mm watch that wears like a 44mm. Its lightweight construction and excellent strap placement make it very easy to wear, even for those of us with smaller wrists. At pre-order prices, the Chronologia Dive Watch is an easy recommendation, but it will be hard to justify at full retail where it faces a host of divers from established giants and micro brands alike. 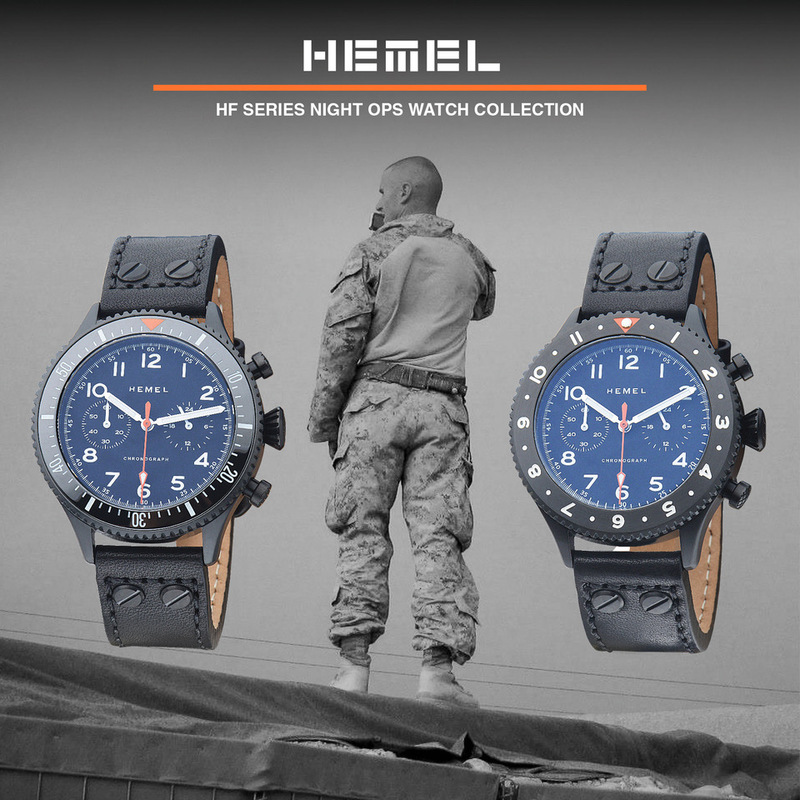 Even limiting its competition to other lightweight tritium tool watches, it must square off against Luminox, Traser, and Armourlite all of which meet or exceed its specs. The Chronologia has a lot going for it, I like the overall shape and the dial layout, and a little tritium is always a good thing. The carbon case and dive-worthy water resistance make it a good candidate for a weekend tool watch, but I'd hold the line at the Kickstarter early bird price. Pro: Attractive, well finished, 200m. Con: Short on tritium tubes, proprietary strap. 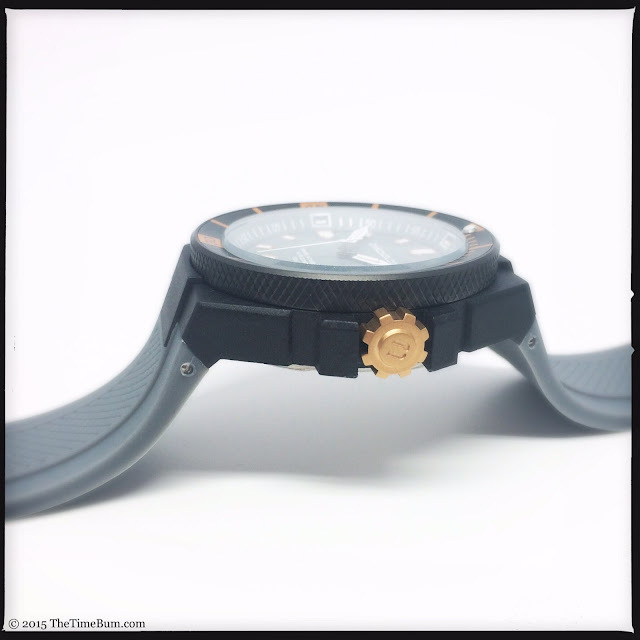 Sum: A nice tool watch for the pre-order price, but hard to justify at full retail.